Three rising English stars won through to the first round of the Canary Wharf Classic after a day of marathon matches in the qualifying finals at Wimbledon. Robbie Temple and Chris Simpson meet compatriots Daryl Selby and Adrian Grant (ranked 11 and 16 in the world) while Adrian Waller has been drawn against German number one Simon Rosner in this high-quality PSA World Tour International 50 event. Hungarian Mark Krajcsak fought back from one game down to beat Italian Davide Bianchetti and he is rewarded with a demanding tie against number three seed Peter Barker, also of England. 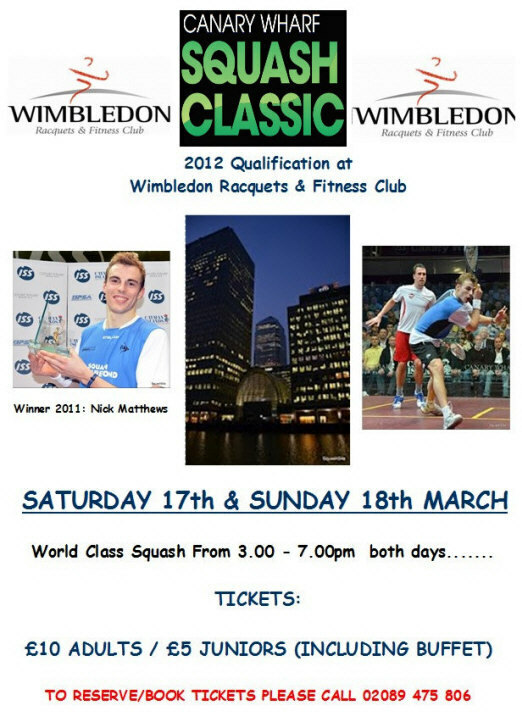 Eight Englishmen are competing in the main draw at the spectacular East Wintergarden venue at Canary Wharf, led by world champion Nick Matthew, the top seed, who faces young Egyptian Ali Anwar Reda in the first round. James Willstrop, who regained the world number one position from Yorkshire rival Matthew in the March rankings, meets his Pontefract training partner Saurav Ghosal in the first round. Temple, the 25-year-old left-hander based in Ealing, won the longest match of the day, recovering from two games down to beat Egyptian Omar Abdel Aziz in 92 minutes. Waller took a modest 51 minutes to overcome English rival Olivier Pett, fighting back from game ball down to win both the second and third games 12-10. Simpson laboured for 79 minutes before halting the challenge of Frenchman Yann Perrin, while Krajcsak was kept on court for 80 minutes by Bianchetti, staging a dramatic recovery to win the fourth game after trailing 7-2. "Managed to get a win in today, pretty ugly game, wasn't feeling great, but very glad to get through canary wharf qualies for the first time," tweeted Simpson. 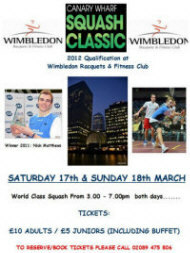 Joey Barrington and Yann Perrin battled themselves to a standstill in the Canary Wharf Classic qualifying competition at Wimbledon before the Frenchman won a marathon match 11-9 in the fifth game. After exactly 100 minutes, Perrin clinched victory to book a place in tomorrow’s qualifying finals. It was a brutal and often physical confrontation with referee Clive Smith called on to make 79 decisions following mid-court collisions. In the qualifying finals, Perrin meets England’s Chris Simpson, who beat Frenchman Julien Balbo in four games. Simpson played strong, consistent squash to win the first two games before Balbo hit form in the third. He led 5-1 and 8-4 before Simpson responded with a run of points to hold match ball at 10-9. However, Balbo hit back to win the tiebreak 12-10. Simpson quickly regained his rhythm to power his way through the fourth game. An attractive all-English tie is in prospect between tall left-hander Adrian Waller and the stylish Olivier Pett following their victories over Ben Coleman and Nathan Lake respectively. Robbie Temple meets the top qualifying seed, Egyptian Omar Abdel Aziz, following quick victories by each player against Phillip Bull and Phil Nightingale. Local favourite Charles Sharpes worked hard against Davide Bianchetti but the wily Italian veteran had too many answers. Despite the match being over in straight games, the match lasted 66 minutes. Sharpes wasted a game ball in the first game and was handed a conduct stroke in the second for abusive language towards the referee. The Surrey star led 9-6 in the third but again Bianchetti hit back to win five points in a row to clinch a place in the qualifying final.